You will build a one degree-of-freedom hovering device which allows the user to select the hover angle then controls the lift-motor with user-selectable parameters to maintain constant angle as the load changes. The motor output signal and actual angle will be displayed as waveforms on the oscilloscope. You will use ProtoThreads and write your program as tasks, the the control loop will need to run in an ISR. A video of a prototype is running here, and with waveform output, and stepping angles with tuned PID. A 2017 solution video of the system built by Kristen Marie Vilcans and Ramita Pinsuwannakub. Lectures from 2017 describing the control system. Lecture 20 ADC and debugging details. 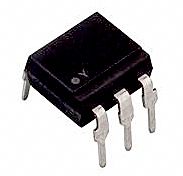 As in lab 2, the SPI DAC you will use is the MCP4822. Use the DAC and keypad examples shown on the Dev board page. Possible pin assignments for TFT-LCD, DAC, ADC and control buttons. Keep the ADC input lines as far as possible from the SPI control signals. Perhaps use A5 and A1. For this assignment you must write your code using ProtoThreads 1_2_1 or later. Thread 1 takes user input to set up PID parameters and the desired angle. Updates the LCD at around 10 times per second. -- Reads the ADC to get the actual beam angle. -- Writes to channel A of the SPI DAC with the actual beam angle to be displayed as waveform on the oscilloscope. -- Writes to channel B of the SPI DAC with the motor control signal to be displayed as waveform on the oscilloscope. An output compare unit uses a timer to produce the actual motor control PWM signal in hardware. In Main you will set up the output compare unit. // set up timer2 to generate the wave period -- SET this to 1 mSec! 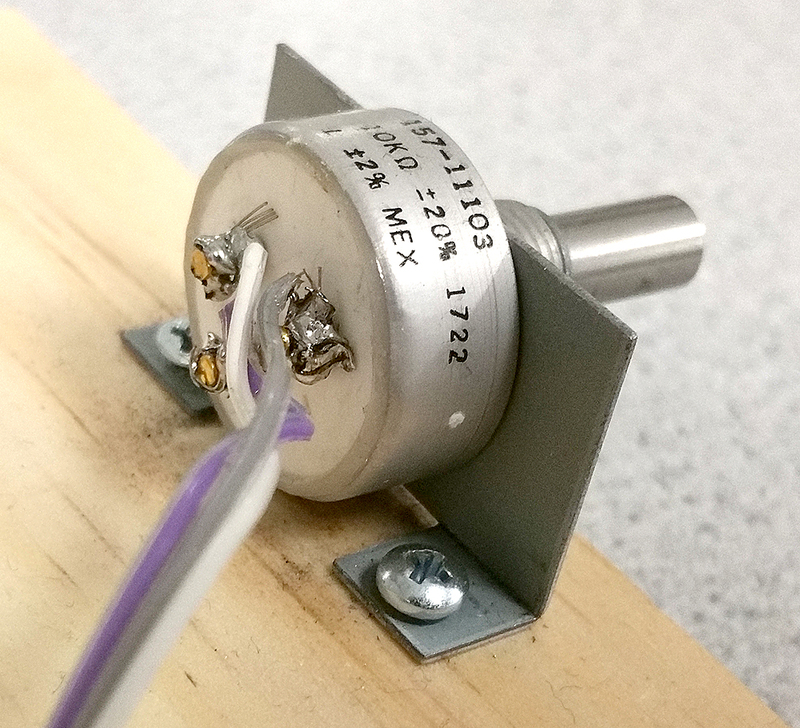 The angle sensor is a 10K potentiometer which costs over $20! 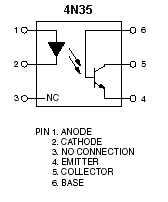 Therefore you will ALWAYS limit current through the potentiometer by connecting a resistor in series with the wiper (pin 2), as shown below! The MCP6242 opamp acts as a unity-gain buffer for the anti-aliasing low-pass filter. You will pick C to be the appropriate low-pass filter for the sample rate you choose. You will connect the output of the opamp to one of the ADC channels on the PIC32. You will need to control the lift-motor from the mcu. 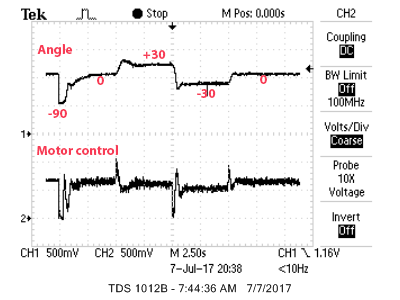 DC motors can cause nasty inductive spikes to wipe out the transistors in the mcu port. The circuit shown below is fairly safe. 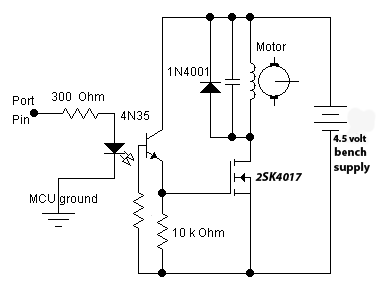 An optoisolator completely isolates the MCU from the motor. The diode placed across the motor shorts out spikes when the motor is turned off on every PWM pulse. The resistor grounding the base of the phototransistor should be set for best falltime, probably around 1Mohm. The motor capacitor should start around 0.1uf. Increase it if there is too much spike noise on the analog input, but be sure to use ceramic capacitors, not electrolytic. Electrolytic capacitors are too slow. The pinout of the 4N35 optoisolator and 2SK4017 are also shown. Note that the bandwidth of the 4N35 is very small, so use a low PWM frequency, perhaps about 1000 Hz. Pin 1 on the 4N35 is marked with a "Y". You will construct the hovering device, similar to the images below. 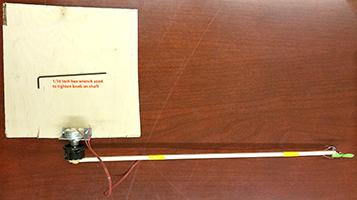 Remember that your group gets ONE sensor potentiometer to use, so be careful. 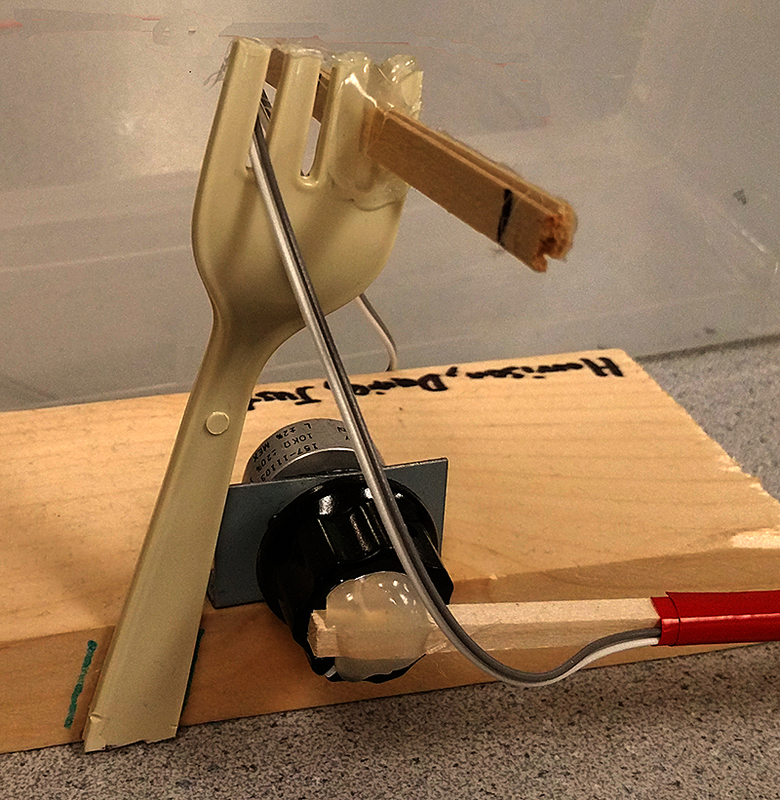 Estimate the natural period and damping coefficient of the beam/motor/sensor that you built. You need these values for the system modeling and tuning. The natural period is approximately the simple pendulum natural period. T=2⋅π⋅√(L/g). Where L is the distance from the pivot to the motor, and g is gravitational acceleration. Using the DAC output to the scope, you can estimate the natural period. Also count the number of full cycles that the actual beam makes before it stops, and adjust the damping coefficient in the matlab code (DD) until the undriven pendulum matches the number of cycles. There are two versions of the matlab code. The first is a simulator using radian measure (with some guesses about motor thrust scaling). The second simulator uses angles measured in ADC units and motor control in PWM units, as shown below. The red line is the target angle. The ADC will probably be set up to measure the 10Kohm servo potentionmeter from zero volts to Vref, resulting in ADC units of 0 to 1023 representing the resistance range of 0 to 10kohm. According to the potientiometer datasheet, the 10K resistance range occurs over 340 degrees of rotation. The useful range of angles for this lab will be 180 degrees (hanging down to vertical above pivot point). The resistance range you can use is therefore 180/340*10Kohm=5.29Kohm, so the raw ADC range will be about 5.29/10*1024=542 counts for 180 degrees rotation. If we set up the potentiometer to read about 520 ADC counts when the beam is hovering at horizontal position, then when hanging straight down the resistance will be about 520-271=249, and when directly over the pivot point about 790. Hot glue a motor to one end of the wooden beam. NOTE: Orient the motor shaft to be at right-angles to the rotation shaft of the knob. Roughen the knob surface using sandpaper. Be sure to remove the plastic film. Hot glue the other end of the wooden beam to the knob surface. Solder a pair of wires (from ribbon cable) to the motor and tape them to the beam. 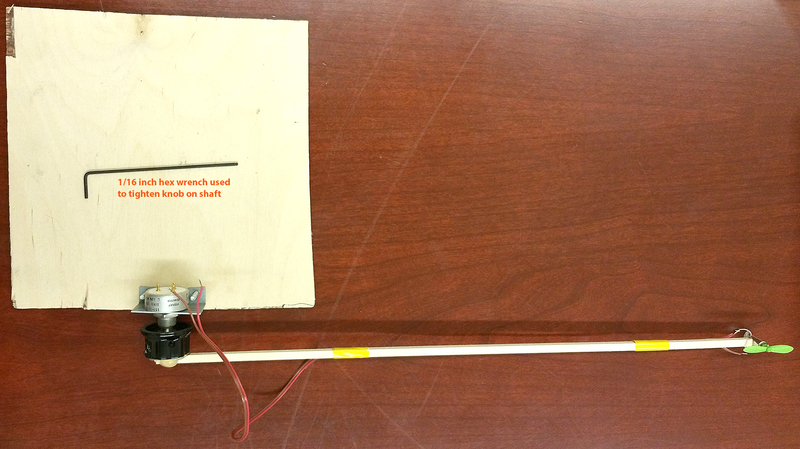 The wires themselves can add weight and torque to the beam. Route them close to the potentiometer shaft to minimize torque. Screw the potentiometer bracket to a chunk of wood big enough that you can use a book to weight it down. Use #4 wood screws, as shown in this image. Hot gluing the bracket to the wood will cost you 10 points on the lab. use the rat-tail (round) file to enlarge the hole. 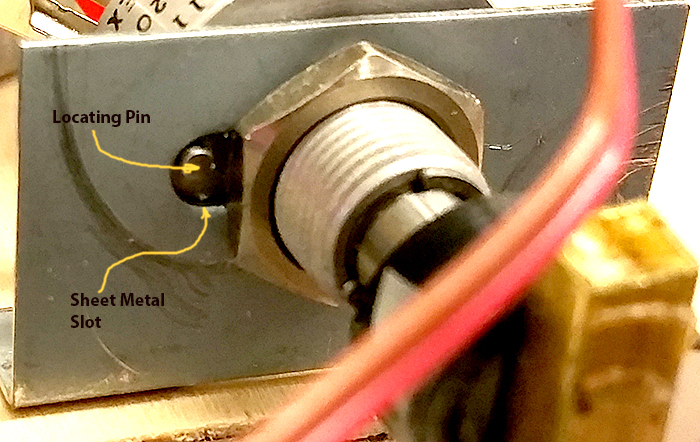 When attaching the potentiometer to the mounting bracket be sure the the locating pin (see data sheet) is in the appropriate sheet metal slot. The shaft on these potentionmeters is freely rotating. Therefore, when attaching the beam to the potentiometer shaft you need to check the whole range of shaft motion for continuous resistance. 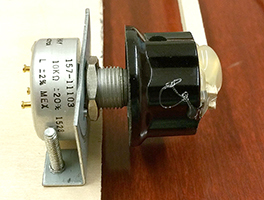 I suggest adjusting the pot to 1/2 full resistance, then attach the knob to the potientiometer shaft with the wooden beam held in the horizontal position. -- Be sure to use pliers to tighten the potentiometer on the bracket. -- Use a 1/16 hex wrench to tighten the knob onto the shaft. Hot gluing the knob to the potentiometer will cost you 20 points on the lab. Solder three wires (from ribbon cable) to the potentiometer. Figure out how to put a rotation-stop on the beam so that the beam cannot go past vertical. year is below. Plastic fork from Mattens. The mechanical assembly finished and be able to control motor speed open loop. Measure the angle of the beam supporting the lift-motor. Format the angle and display appropriate messages on an LCD. 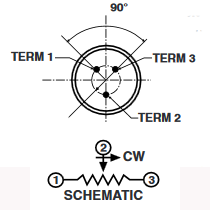 Note that you will need to read two channels of the ADC to read sensor postion and potentiometer. the more general ADC multichannel example on the Development Board page. See also the ADC page. Set the desired beam angle. Set the PID proportional gain. Set the PID differential gain. Set the PID integral gain. Button 1 puts a selection cyclically onto one of the 4 parameters displayed on the LCD dispay. Pressing button 1 also freezes the parameter values used in computation. Turning the potentiometer changes the value of the parameter. Button 1 may be used with the potentiometer to change another parameter. Button 2 loads the new parameters for use in computation. Use a PID algorithm to control the speed of the motor by producing a PWM drive to the optoisolator. PWM setup example. Tune the PID algorithm so that you can change the angle of the beam quickly and accurately without excessive angle oscillations. One set of coefficients should produce stable behavior over a range of desired hover angles. The user should be able to enter a desired hover angle and the motor should quickly change the beam to the new angle. The initial angle of the beam should be around -1.57 radian (hanging straight down). 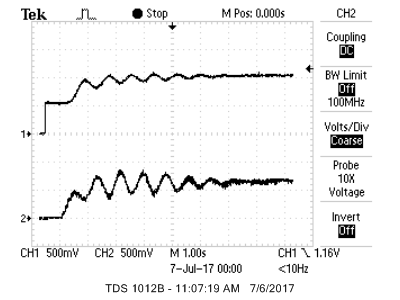 Display the motor control value (not the raw PWM signal) on the scope using channel B of the DAC. Display the actual beam angle, from the angle sensor, on the scope using channel A of the DAC. At time=0, when holding the reset button, the beam should be hanging vertically. At time=0, target angle should be set to horizontal. At time=5 seconds, target angle should be set to approximately 30 degrees above horizontal. At time=10 seconds, target angle should be set to approximately 30 degrees below horizontal. At time=15 seconds, target angle should be set to horizontal. You will demo all the features above to your TA. Your program should not need to be reset during the demo. A schematic of the circuit you built. Scope screen dumps of typical two-trace: (1) motor-control and (2) actual angle. Include the demo sequence of four angles. A summary of the accuracy of your measurements. How accurately can you measure the angle? How you selected the three PID gains. 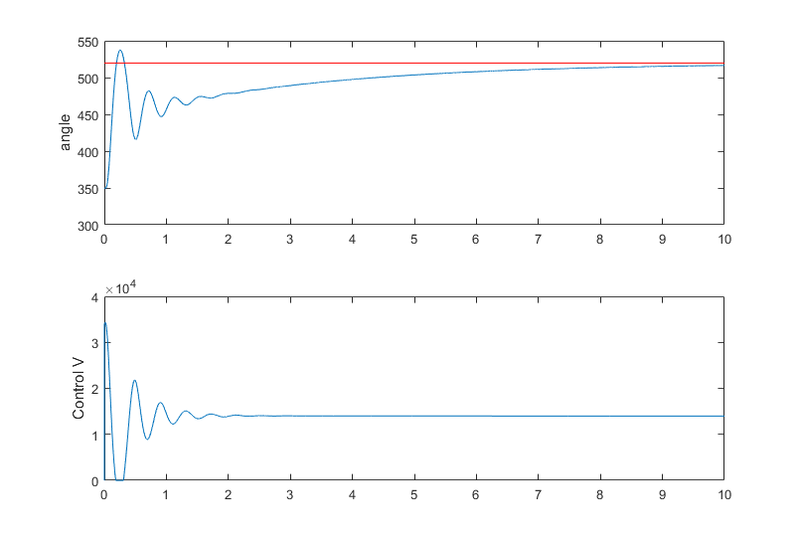 What are the maximum/minimum angles that produce stable behavior for your PID gains? What are the settling times at different angles.